Congratulations! Your WordPress site is up and running. 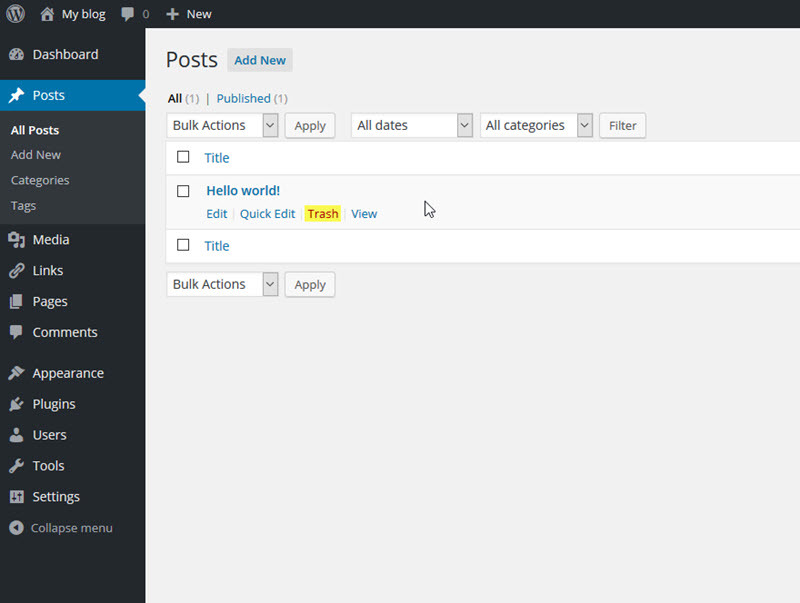 Now, it’s time to change some automatic features and customize the design of your blog or website. Now is the perfect time to personalize your site. 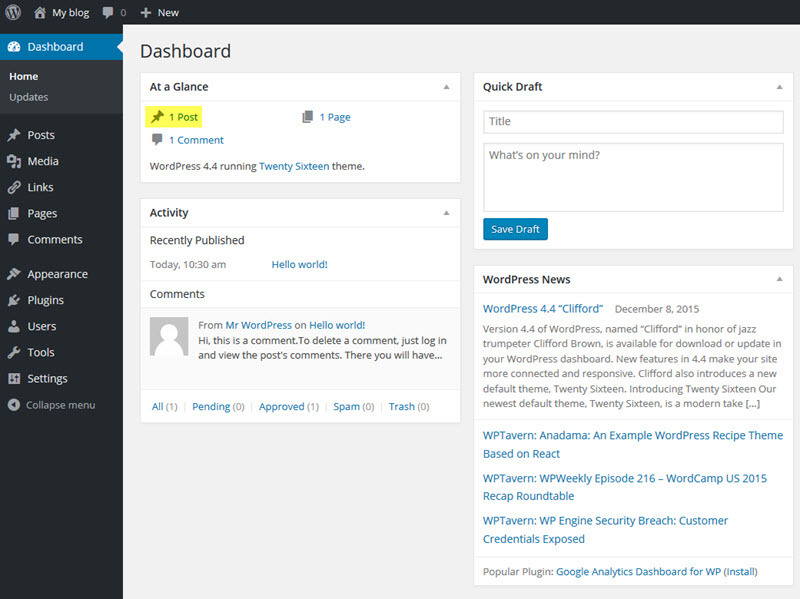 Follow these steps to access your WordPress dashboard. 1. From your cPanel, in the Web Applications section under My Applications, click My Blog. 2. The My Applications tab appears. Click the link ending in /wp-admin. This link directs you to your WordPress admin site. Going forward, you’ll log in directly to WordPress using the credentials you previously set up by visiting domainname.musites.org/wp-admin. 3. 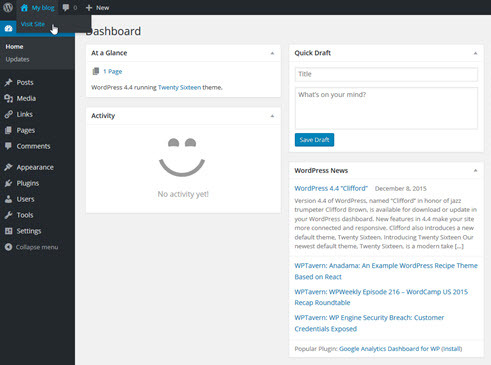 Your WordPress dashboard appears in a new tab. The dashboard is the first page you see when you log in to the administration area of your site. Your dashboard gives you an overview of what’s happening with your site. You can quickly view all your posts, pages, and comments. You can read the latest WordPress news and access the different areas of your site. 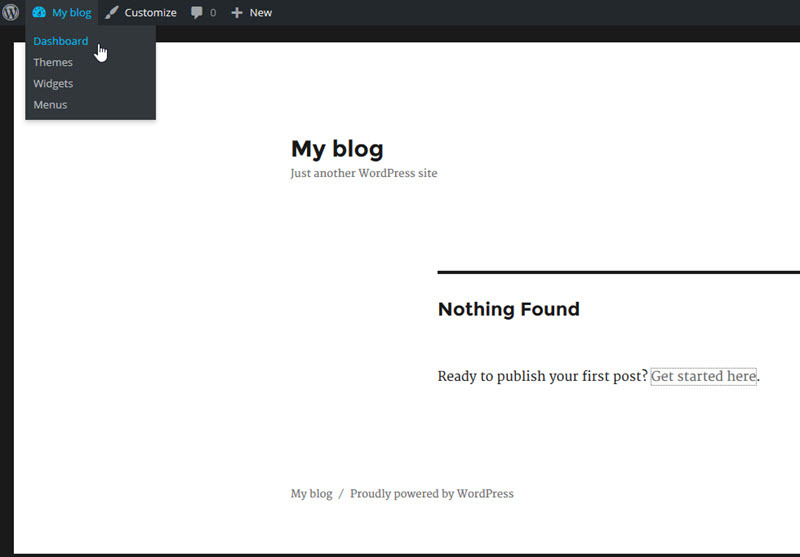 WordPress automatically publishes a blog post called Hello World. It also posts a comment by Mr. WordPress on that blog post. 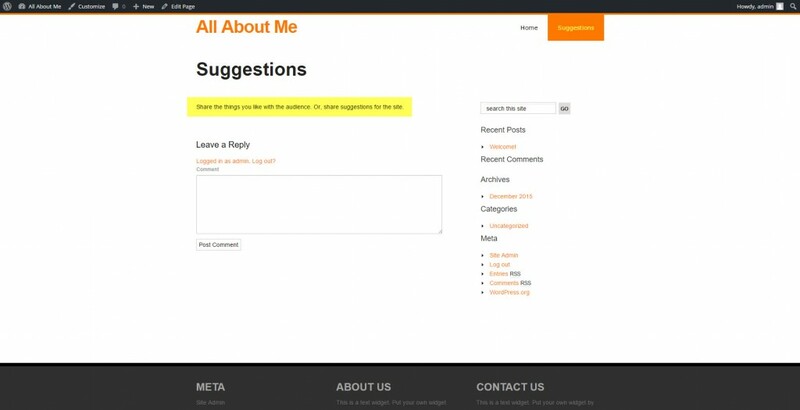 These features demonstrate how posts and comments appear. They should be changed immediately so your blog doesn’t look new. Follow these steps to delete the automatic features. 1. Under the At a Glance section, click 1 Post. 2. Click the blog post title. 3. The blog editor appears. Here, you see the post title, content, assigned category, and publishing options. You have the option to edit the blog post or delete it. 4. Click Move to Trash to delete the post. Deleting posts also remove any comments associated with the post. Alternatively, you can delete a post from the blog post title page by clicking Trash. Follow these steps to give your blog a title. 1. 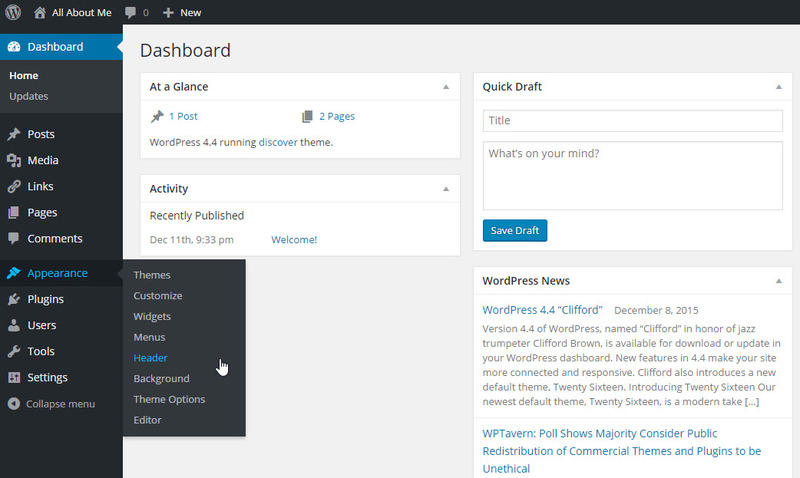 From your WordPress dashboard, hover your mouse over My blog, located in the top-left corner of your dashboard. To return to your dashboard from another page, click Dashboard from the top-left corner of the page. 3. The public view of your blog appears. My blog and represent your blog title and tagline. You can give you blog any title. Common blog titles reflect the site’s domain name. Your tagline is a very short description of your blog. 4. Return to your dashboard by hovering your mouse over My blog, and then clicking Dashboard. 5. Click Appearance, and then click Customize. 6. An editor pane opens. Any changes made will automatically reflected on your site. 8. Makes updates to the Site Title and Tagline text boxes. 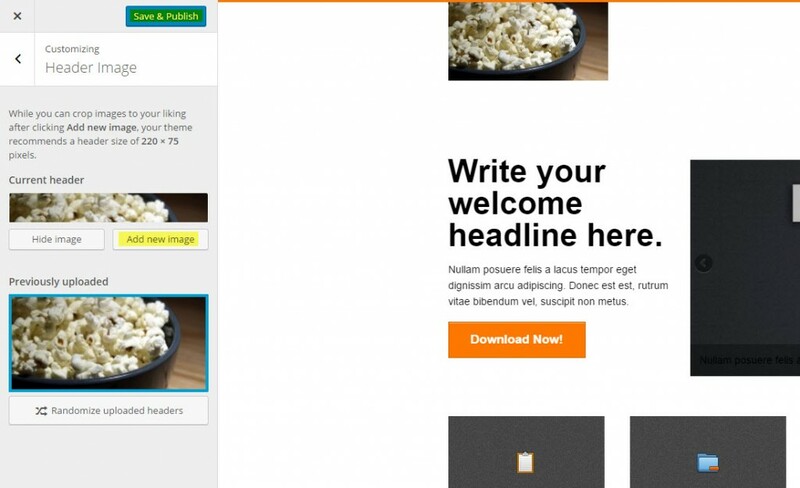 Your site will change as you type. 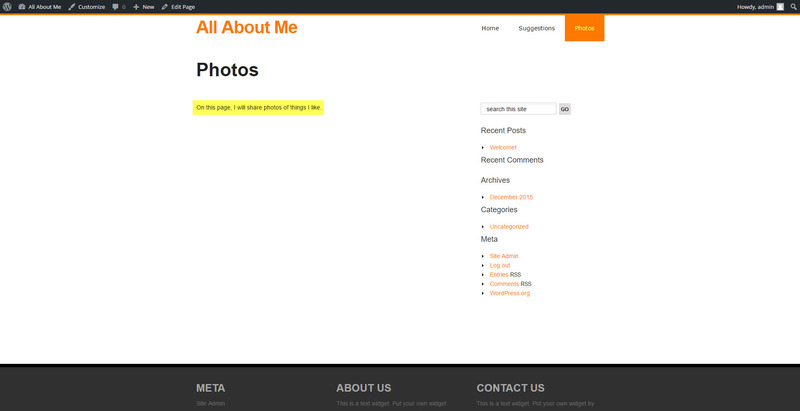 If you don’t want a blog title and tagline visible on your page, unselect Display Header Text. 9. Click Save & Publish when finished. 10. Return to your dashboard by clicking the X in the top-left corner. The appearance of a WordPress blog is driven by the theme assigned to it. When WordPress is installed on a site, it’s given the default WordPress theme of the year. Some things to keep in mind when choosing a theme. Some themes are designed to feature blog posts prominently. Others are designed for online stores or portfolios. Responsive themes are for mobile viewers. The theme automatically adapts to mobile viewing without any extra coding or special options. WordPress is customized through plugins, which is an add-on application that helps customize sites. Plugs are involved in every level of customization from adding carousel images on your homepage to page building in your posts. Your theme doesn’t have to be permanent. It can be uninstalled and another theme can be installed at a later date. The theme you choose will impact what kind of website you publish. If you like the general layout of your blog, skip this step. Otherwise, follow these steps to change your theme. 1. From your dashboard, click Appearance, and then click Themes. 2. 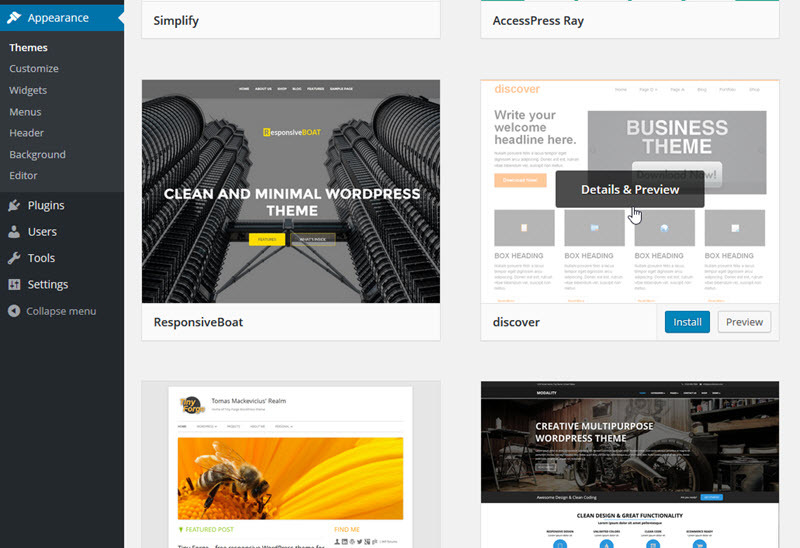 Installed themes appear; WordPress is comes with two additional default themes to choose from. 3. To add a new theme, click Add New Theme. 4. Search for a theme by clicking Featured, Popular, or Latest. Or, you can click Feature Filter to search based on different filters. Some these come with different color schemes while others only feature one color. If you know you want an orange color theme, search for themes with that color scheme. 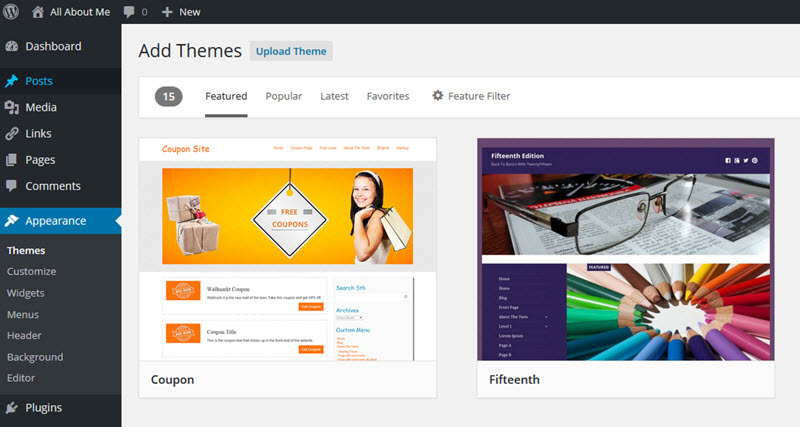 Make sure to preview the theme prior to installing it so you find the theme that best suits your needs. 5. Click the theme’s image to preview it. Once you’ve picked a theme, click Install. Please note that depending on your chosen theme, your site’s tagline may no longer appear. 6. If you’re happy with your selection, click Activate. If you’d like to choose a different theme, click Return to Theme Installer. 1. From your dashboard, click Pages, and then click All Pages. 2. Click About to change the page’s text and title. This is a sample page created automatically by WordPress. 3. The page editor appears. Replace the default title and text with a title and text you want to appear on the page. 4. Click Update, when finished. 5. When you view your site, the updated page name and description appears (depending on your template). 1. From your dashboard, click Pages, and then click Add New. 2. The page editor appears. Type a title and text for the page. 3. Click Publish when finished. 4. When you view your site, the new page name and description appears (depending on your template). Depending on your WordPress template, you may not be able to see the new page. If this is the case, you must create a menu. A menu provides links needed to access pages you created from your website’s main page. Follow these steps to create a menu. 1. From your dashboard, click Appearance, and then Menus. 2. Type a menu name in the Menu Name text box. 4. Add pages to your menu. Select the pages you want to appear in your menu. 5. Click Add to Menu. 6. Drag and drop the pages in Menu Structure rearrange their appearance in your menu. 8. In Menu Settings, select the Auto add pages checkbox to automatically add newly-created pages to your menu. 9. Select the Theme locations checkbox so your menu appears on your homepage. If you don’t select this, your menu won’t appear on your homepage. 11. When you view your site, the menu appears (depending on your template). Clicking each menu item will direct you to those pages. Different themes have different menu options. The instructions above should work for all themes; however, some themes automatically build menus, so if you can’t find the above options, check your site to see if your theme already has a menu in place. A header image is the image at the top of your site’s pages. Your header helps you express your creativity to your visitors and gives them a chance to visually connect with your blog. 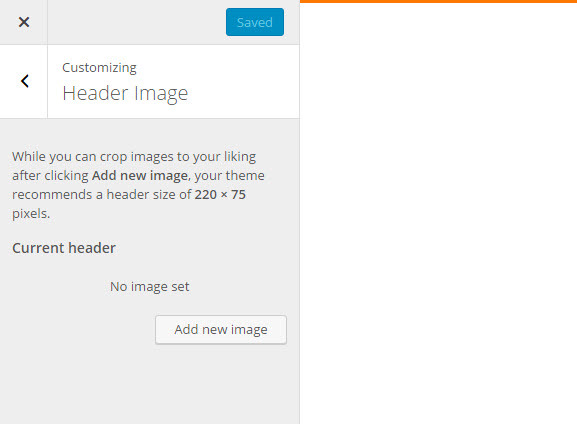 Almost all WordPress templates allow you to change your header image. Before you change your header image, please review information about copyright on the Copyright and Attribution page. You cannot use copyrighted images on your site. There are several search tools available online to help you find non-copyrighted images. When searching for an image on google.com, click Search Tools. From the Usage rights list, choose Labeled for reuse. This ensures the image you choose isn’t copyrighted. There are many other sources for obtaining copyright-free images. The below list details some of these sources. 1. From your dashboard, click Appearance, and then click Header. 2. Click Add new image. 3. Drag and drop your new header image or click Select Files to upload the image. 4. Click Select and Crop. 5. Drag the arrows to crop your image to your preference. 6. Click Crop Image when finished cropping your image. 7. A preview of your new header image appears. If you’re satisfied with the appearance, click Save & Publish. If you want to re-crop your image, click Add New Image. 8. Click Save & Publish when finished. 9. Close the edit menu by clicking the X in the top-left corner.